Given that a person’s teeth are one of the first things others notice, it is no wonder more people are turning to dentists to address stains and discoloration. Whether they’re seeking a brighter smile for an upcoming event or to fulfill a life-long desire for an improved dental appearance, Dr. Hugh Allen provides professional in-office and take-home teeth whitening in Pembroke Pines to help his patients accomplish their individual goals. Why Receive Professional Teeth Whitening? While there is no shortage of over-the-counter whitening options, these are rarely strong enough to address more pronounced dental staining. Discolored teeth can be the result of factors that are simply beyond the ability of commercial grade products to manage. These can include poor at-home care, smoking, and coffee. Even if you keep good hygiene and avoid foods and drinks known to cause staining, the aging process itself has an aesthetic impact. Care from an experienced cosmetic dentist is the best way to regain an attractive smile. If you are concerned about the appearance of your teeth, schedule a consultation with Dr. Allen to discuss your options. Our dentist takes the time to understand your expectations and evaluate the causes behind your cosmetic issues when developing a treatment plan. Dr. Allen recommends a teeth whitening system that both dramatically improves the color of your smile and accommodates your individual needs and lifestyle. Many patients feel they don’t have the time to receive professional whitening. 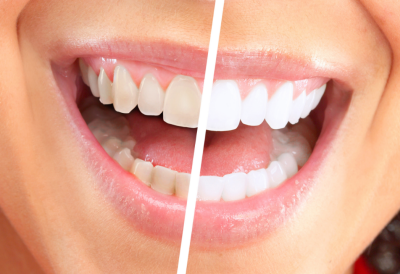 At Allen Dental, we offer in-office teeth whitening options that enhance dental appearance in less than an hour. Dr. Allen makes recommendations for treatment based on the level of staining present and your timeline for results. With Opalescence Boost®, our dentist carefully applies a powerful whitening agent to produce a brighter smile. If you don’t have a full hour, Dr. Allen uses Venus White Max® in just five 15-minute appointments to improve the color of your teeth by a minimum of five shades. No matter which option best suits your needs, we supply you with touch-up kits to preserve your results. Following up regularly with Dr. Allen also promotes the longevity of your new smile. Our practice has multiple options available for professional take-home whitening, including Colgate Optic White®, Opalescence®, and Venus White Pro®. With each of these choices, Dr. Allen provides custom-fit trays, which fit comfortably and give the whitening gels the opportunity to take full effect. Patients often experience less sensitivity through this measured approach when compared with shorter-term alternatives. Consistency is enormously important to achieve the full benefits of take-home whitening. Our dentist recommends wearing the whitening trays overnight or twice a day for a half an hour. Unhappy with the State of Your Smile? Call Us Today! From the beginning, the mission of our Pembroke Pines practice has been helping our patients gain smiles they are proud of. If discolored teeth are keeping you from smiling with confidence, Dr. Hugh Allen can assist. To learn more about your options for professional teeth whitening, contact Allen Dental today.